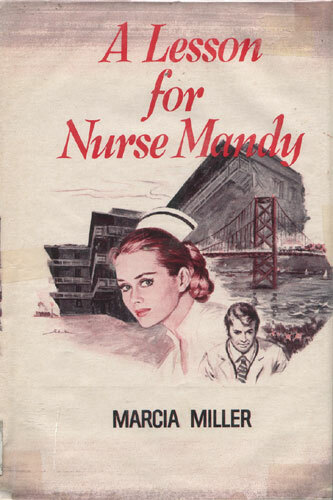 Life on the third floor of California General, one of San Francisco’s newer hospitals, had its share of ups and downs for copper-haired Mandy Lewis, a professional-minded nurse. All was taken in stride, however, until the new resident, Clay Elliot, took over the floor. When he called Mandy to task for her tactics with an especially difficult patient, her usual even temper responded in kind to his somewhat supercilious tone and manner. The infuriating thing about Clay Elliot — tall, dark, and blue-eyed — was his surprising amount of charm. And, in spite of herself, Mandy found that she was gradually succumbing to Clay’s personality as well as appreciating his abilities as a fine doctor. So much so, in fact, that when she learned that Clay had been seeing the lovely blonde socialite Lisa Wainwright, her distress was acute. Convincing herself that she didn’t care, Mandy accepted several dates with Clay and later — to her amazement — realized that it was she whom Clay really cared for. But Clay’s mother, an aristocratic woman whom Mandy had once met, made it clear that someone like Lisa Wainwright was more suitable for her son. And when Mrs. Elliot phoned Mandy to discuss in private a matter of vital importance, Mandy was filled with trepidation — and rightly so. It takes the clever aid of Mandy’s mother — who has flown in from New York for a visit — to teach Mandy the true meaning of trust and the danger of a false accusation.